A Winters Walk along the old railway line Yarmouth. I used preliminary sketches and photographs and did the finished painting in the comfort of my own home. 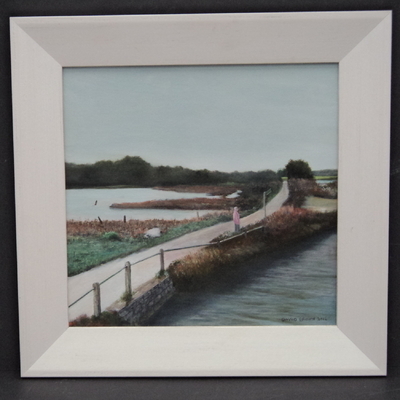 The medium is acrylic painted on board and the painting has been framed in a plain white deep chamfered frame. An amateur artist who since retirement has managed to combine his love of painting with a picture frame business. In the process has made friends with lots of people with a like minded interest.